Despite having only signed up for the 2011 Lloyds TSB Cardiff Half Marathon a week before taking part, Leah Paige Watts completed the run in just 2 hours and 8 minutes and was quite rightly very pleased with her finishing time. 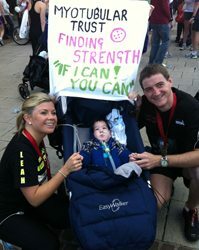 Leah chose to raise sponsorship for the Myotubular Trust, in recognition of her friend’s 9 month old son, William, who has myotubular myopathy. We would like to thank and congratulate Leah for her support and for raising such a great amount in sponsorship and also Keiron for running with Leah too. 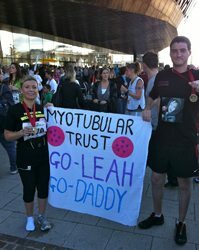 Our thanks go also to Leah’s supporters for making such fantastic banners and t-shirts; they all looked great!